The Oxygen Diet Solution was created with the assistance of Dr. Susan Kleiner, a nutritional consultant who has worked with elite athletes. This book includes a variety of 28-day diet plans that have been designed to suit your unique needs. Oxygen Magazine has been empowering women to achieve their health and fitness goals for 15 years. So, they decided to give their readers a manual that would provide access to their cutting-edge information in book format. The creators of Oxygen Magazine know that one-size-fits-all approaches don’t work because every woman is unique. For that reason the Oxygen Diet solution contains five different meal plans specifically created for a range of health and fitness goals. You simply decide which of the following profiles fits your needs then follow the relevant 28-day diet and meal plan. Recommended if you have more than 15 pounds to lose. Ideal if you want to rapidly lose weight to get ready for an upcoming special event . For women who struggle to have enough energy to exercise and feel tired during the day. Helps improve your resistance to illness if you frequently suffer from colds and flu. Certain foods are highlighted because they can help reduce the negative effects of stress. These foods are included in the meal plans and you can also incorporate them into your diet once you have finished the 28-day Oxygen Diet program. Walnuts reduce your blood pressure response to stress. To get these benefits you should consume 1 ½ ounces of walnuts daily. Salmon contains omega-3 fatty acids, which reduces your heart rate during times of stress. Aim for two to five meals of fatty fish per week. Bananas are high in potassium known for controlling blood pressure and heart function. Oranges are high in vitamin C, which can reduce your production of the stress hormone cortisol. Other good sources of vitamin C include red peppers, cantaloupe and strawberries. Eggs, chicken breast, turkey, shrimp, scallops, tuna, salmon, rainbow trout, sardines, halibut, lamb, beef, cottage cheese, plain yogurt, whey protein, whole-grain bread, almonds, walnuts, avocado, grapefruit, apple, berries, lettuce, tomato, cucumber, Swiss chard, cabbage, bok choy, mushrooms, green beans, asparagus, extra-virgin olive oil, light salad dressing, stevia, coffee, tea. An exercise routine is provided that you use in conjunction with your preferred diet plan. Included are photographs that clearly demonstrate the correct way to perform strength exercises using a set of dumbbells. The Oxygen Diet also features advice on fitness for pregnancy and how to maintain motivation and fitness when traveling. 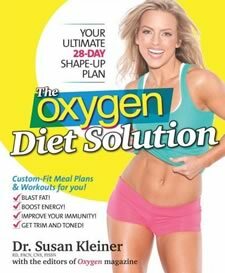 The Oxygen Diet Solution: Your Ultimate 28-Day Shape-Up Plan retails at $24.95. Click Here to purchase the book for a discounted price. The Oxygen Diet Includes five 28-day meal plans to suit different health and fitness goals. Encourages consumption of a wide range of fresh and unprocessed foods. Provides 35 simple recipes with vegan and gluten-free options. An exercise plan is included with photographic illustrations of strength exercises. Offers advice on goal setting and motivational success stories. The meal plans are fairly strict and require elimination of a variety of foods. Necessary to prepare meals at home for the duration of the 28-day Oxygen Diet program. Fitness program includes a limited number of exercises and may become repetitive over time. Does not provide options for dieters with allergies to nuts. The Oxygen Diet Solution offers five different 28-day meal plans to suit a variety of health and fitness needs. It will appeal to dieters who prefer to follow a structured menu designed for to achieve a specific goal.